When you’re planning a vacation to Puerto Vallarta, Mexico, it’s nice to know that the medical equipment you depend on at home is also available for rental abroad. And for those travelers who use wheelchairs there’s excellent news: With a beach wheelchair rental the sand and ocean are now accessible! Enjoy the pleasure of being able to roll along the beach with ease! Below are a few of the Puerto Vallarta businesses that provide medical equipment rentals for travelers as well as the beach wheelchair you’ve been dreaming of. Many of these companies offer delivery at the airport as well as delivery and pick-up of the equipment to your resort or vacation condo. The owners of Beach Crossers are a delightful and enthusiastic team dedicated to making mobility easier for travelers to Banderas Bay to include the areas of Puerto Vallarta, Nuevo Vallarta and Bucerias. While their inventory is comprehensive for the disabled traveler with everything needed to enjoy mobility on vacation, their specialty is beach wheelchair rentals and beach stroller rentals. Read their heart-warming story: Trending Topics > Beach Crossers. A beach wheelchair or stroller can give you the sand and ocean accessibility you’ve been dreaming of! 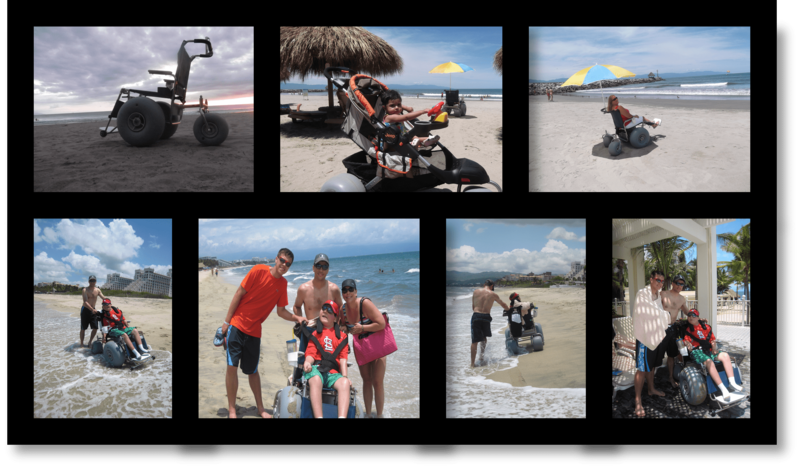 Items now available for rent in Puerto Vallarta and Nuevo Vallarta: Beach wheelchair, beach stroller, and more. Beach wheelchairs, beach strollers, and other unique mobility devices can be booked at www.beachcrossers.com. Chair rentals start at $40 USD per day, and strollers at $20 USD per day. The minimum 3-day rental includes both delivery and pick-up all around Banderas Bay from Bucerias in the north all the way south to Mismaloya. Beach Crossers welcome inquires and special requests. Owners speak English and Spanish. CPAP (Continuous Positive Airway Pressure) machines are used by people with sleep apnea to provide a steady air flow into their lungs, allowing for a deep and restful sleep. These machines can be rented through PV Sleep Well. This company also offers the sale, rental, service and repair of CPAP equipment, and the sale of CPAP masks, accessories and supplies. Additionally, PV Sleep Well now offers oxygen concentrator rentals. Most costs are covered by insurance, and cash discounts are available. Owners speak Spanish, English and French. Mexico Accesible enables the Oxygen Traveler to rent equipment, such as wheelchairs, scooters, oxygen cylinders, concentrators, bedside commodes, etc. Rental items also available: standard wheelchair, electric wheelchair, beach wheelchair, scooter, walker, elevator, and bathroom equipment. For your transportation needs, Mexico Accesible offers ground transportation from the airport to your final destination. Additionally, van rentals are available that include a hydraulic lift, removable seats to accommodate any size wheelchair or scooter (including a beach wheelchair) as well as a television, VCR, stereo, reclining seats, overhead bins, and more. They even offer guided tours in their specially-equipped vehicles. When traveling to Puerto Vallarta, Mexico, it’s recommended that the wheelchair you bring or rent has flip up and cut out arm rests rather than ones that lock into place or are extended out in a fixed position. The type of arm rests that are on standard, heavy rental wheelchairs will cause you to be seated at restaurant tables with your wheelchair positioned far back and away from almost every table you dine at; imagine how unpleasant it would be to have to prop up a dinner plate on your lap! The great majority of restaurant tables in Mexico have a lip just underneath the tabletop, which makes it virtually impossible for a wheelchair to slide right up underneath it. You’ll be very grateful to have flip-up arm rests in these instances. When seated at any table without a lip, cut-out arms make it possible to slide the wheelchair right up to the table, which is not at all possible with the fixed-arms type. – This awesome wheelchair tip was gleaned from Cathy J., Midwest, USA.